May 2014 – Diesel. Powered. As an intersting follow up to the little factoid I discovered for myself about some early European history relating to Australia, I have done a little reading about the French ships sighted off Port Jackson on the 24th of January 1788. The French were on an exploritory expedition to discover lands in the south Pacific in order to establish trade contacts, trade routes and potential colonies as well as researching other European exploration in this region. On the 24th we beheld an English fleet at anchor inside Botany Bay, of which we could see the flags and pennants. Europeans are all compatriots at such a great distance and we were most impatient to reach the anchorage, but the weather was so foggy the next day that we were unable to see the land, and we only reached the anchorage on the 26th at nine o’clock in the morning. The ships, L’Astrolabe and La Boussole, carried botanists, astronomers, hydrographers, artists and natural historians and were well equipped with an impressive array of scientific tools, timepieces and navigational equipment. The two French ships later continued on their journey and were wrecked near the Solomons thus failing to return to France. Meanwhile the world preceded to turn for France with the revolution gaining impetus by the time the dispatches and journals, from this expedition, reached England in June 1789. A French naval contingent was sent on a journey in 1791 with the intent to discover the whereabouts of the Astrolabe and Boussale. This expedition charted some of the WA coast, named the township of Esperance (my father’s home town) and the Huon River among other things. The La Pérouse ships were dicovered many years later by others. King Louis VXI was reported to be asking about news an La Pérouse’s expedition the morning he was taken to be executed. Author CJPPosted on May 11, 2014 May 19, 2014 Categories UncategorizedLeave a comment on L’Astrolabe and La Boussale. Time for my other hobby. The not so healthy one that is. 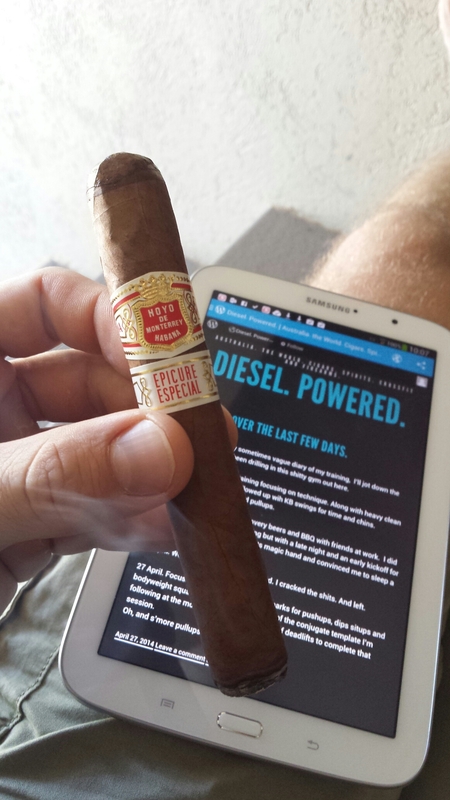 This one’s a cuban, a Hoyo De Monterrey Epicure Especial. I’ve had these sitting in my humidor for about a year now and they’re getting better. Nothing on the Epicure No2 though. Author CJPPosted on May 3, 2014 Categories UncategorizedLeave a comment on Time for my other hobby.